Here we go, it’s high school reunions time when we hear the call of days past and feel the need to revisit out teen years...at least some feel that way. Maybe we want to go back because high school was a time when much that is good and bad about our identities is forged or better or worse. If you ever thought of yourself as a jock, Valley girl, or math geek you probably first thought it in high school – probably because someone else called you it. Though, most of us have moved on from these identities to form longer lasting ones (e.g. mother, engineer, community activist) our high school identities hang around. 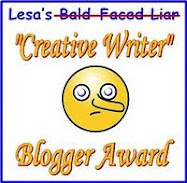 I have a cousin who still has his library trophy award on the mantel. Reunions seem like a lose-lose proposition. If you were a bit of an outcast the first time around, why in all that’s holy would you want to subject yourself to standing in a room full of people who made you feel that way. If you were the prom king or star athlete, you probably aren’t anymore. why we would watch a Friends reunion show. We know it wouldn’t be very good, but we still want to know how the story turned out. All these people from high school were in the story of our lives when it was at its most intense…at least is seemed that way. None of us had any idea who we would be 25 years later (or even 5 years later), but now that that time has arrived we want to see how the stories played out. Even when I’m watching a third rate movie on an airplane, I still want to see how it ends before they turn everything off at landing. Also, I think I owed these people something. They made me better. Neither of my parents went to college and being a girl they didn’t think I needed to go either. But the kids I hung with in high school all had college plans so I wanted to go too. Peer pressure for the better. So what about you? 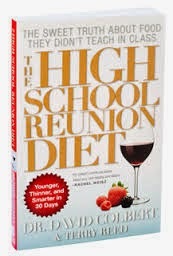 Are you in or out on high school reunions? Have you ever gone? Plan to go? Would not want to see those kids again for all the money in the world? 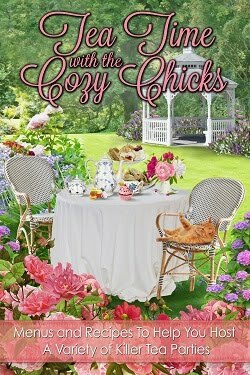 Let me know and I’ll give away two romance books from the answers. I have a funny story. I was nice to everyone in highscool, but since I wasnt a partier, rarely hung with most of them. Anyway, I was only able to go to one. I think it was ten year. The place was having 2 reunions at once. One with kids about 20. The other, with real old looking folks. Oh, that was my class. Opps! I always thought I'd go to my high school reunions, but I've never made it to one. As for the draw, for me it has to do with connecting with the friends I had again. I'm so bad at keeping up with people in real life, and this is a good excuse to reconnect. 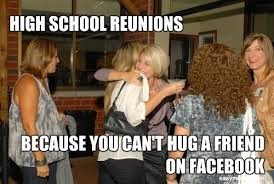 Most of the friends I'd want to reconnect with are in the grades up or down and I haven't felt the need to go to any of my reunions. Last year was the 30th. My husband hasn't wanted to attend his either. Great post, Duffy! I think you're right, we go to these reunions because we "want to see how things turned out." I went to a Catholic girls boarding school and the students were from all over the country--we even had some international students--so no one ever got together for class reunions. And I went to a college in the Midwest and never managed to get back for a reunion. 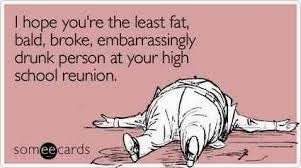 I always like hearing about other people's reunions, though! We went to our 50th and had a great time. The class has about 25 people left now. I would go to a 60th. Next year will be my 60th reunion. Not that I will go. I lived in a small town so my good friend (not in my class) who still lives there lets me know about any people who are still there. I went to my 20th and none of my friends went. I think there must be about 45out of 90 or so of us left now. I do keep in contact with two friends from high school and grammar school. With Classmates.com I have checked on a few of the others but that's about it. Facebook also works with catching up, if I want to. My class's 10th reunion was very well attended. I was in a class of around 200 and the reunion was held on Labor Day Weekend, when a lot of young families come back to town to visit anyway. It was held at the VFW - very economical - food was cold cut and vegetable platters and chips. Cash bar. People could afford the tickets. Then the reunions upgraded to weekend extravaganza's starting with wine tastings and golf outings and picnics and ending with fancy dinners at out of town hotels. Very expensive and all inclusive, so a lot of money for those who were paying for sitters and don't play golf. and after the one I did attend, my husband and I went out to dinner afterwards since the food was so terrible. We had name tags that featured our 5th grade school pictures (our district did a school wide yearbook that year) and no names. This was no help -I knew I knew these people - I just could not remember their names! Starting with our 30th, the reunions are held at a classmates home who likes to show off his "ranch". I do not attend but understand that the cost of the ticket includes dinner in a party tent on the property complete with beer kegs and port a pots. Since I quit attending functions with beer kegs and port a pots after turning 18, and this classmate was known as a bully since I met him when he was 5, these events do not attract me at all. I do still regularly meet with my "crowd" from high school. Facebook makes it so much easier to keep in touch with those you want to keep in touch with. Hi, Mark. I’m bad a keeping in touch too and the reunions would be a good place to start. Some really nice kids there for sure. Nice that you had so many friends in high school in your own class and other grades that doesn’t happen that often. Lucky you. Boarding school is a whole other world. I think that would be amazing to be with kids around the world and see how they live and what they thought about things. A reunion would be tough as they are scattered all over. What a neat experience. Hi, Gram. It’s so hard when you see how many have passed. Hi, Diane. Yes, they say that FB is the online class reunion. I love it for keeping up with people. Best ever for that. Hi, Miss Merry. Yeah if the reunion was at an old bully’s house I so would not go either. UGH! Nice that you keep up with your crowd and FB sure does make it easy. I'm working on my 50th reunion now. We have one every 5 yrs. and I've worked on all since our 10th. We going to the school on Friday night to take a tour have have pizza and subs. A lot of my classmates haven't been back since we graduated. It sure has changed and I think they'll be glad to tour it. We're having our dinner on Saturday night. We also have a lunch every month for the local people. Some come and some don't. I enjoy visiting with everyone but I know some don't care to see their classmates. I just don't understand that. My 45th is in a couple of weeks, but after attending every one of them all these years I've decided not to go this time. It's always the same people, and most of them are not the kids I ran around with back then. That group is still apparently not over high school, and while I feel bad for them, I wish they'd get over it, already and come and hang out with me. Mostly, the cliques still hang together, especially if the members still live in town. I moved away a year after graduation, and don't belong to a clique. 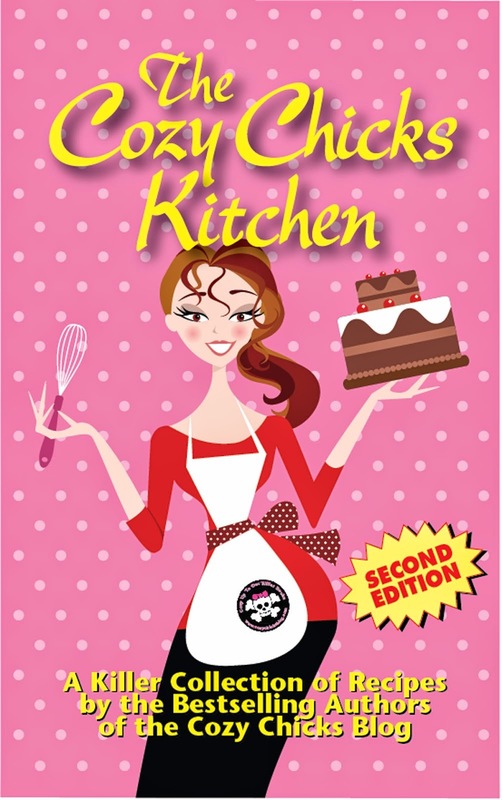 After my 30th, which was a lot of fun, I told my husband, "You know, none of those people remember me from high school. They remember me from reunions." On the other hand, I really enjoy getting together with classmates from grade school (up to the eighth grade in our Catholic schools). And at most of the reunions our elementary school is over-represented among the classmates. I just went to my 10 year high school reunion this past weekend. It was not very well attended but it was a lot of fun. It was a few of my best friends (who I see on a regular basis) and some other people who I didn't really talk to. We all had a blast, chatting, having drinks. 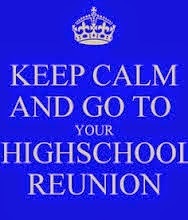 I don't think reunions are for people who aren't over high school (at least not in my case anyhow). It was a fun excuse to go out for a night and have some laughs with people I haven't seen in a long time. We are planning another get together around Thanksgiving, maybe more people will be able to come. I have gone to every reunion for the past 10 years -- just had my 45th. What amazed me is that some of the nuns I had way back when are still around, and they haven't changed a bit! Heather, you might change your mind once some of your classmates pass away. I know that happened with my class. 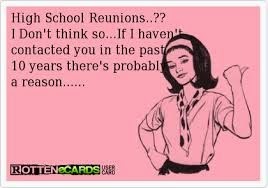 Never went to a reunion, never will. I am in contact with two high school friends. One from each high school I attended. I was tempted to attend my 50th, but had wedding the month before and didn't want to make the trip twice. Hi, Barbara. That you stay in contact with two of your classmates is more than a lot of people do. So nice that you have all this history together. Old friends are amazing. Oh Mary Louise. That’s a point I didn’t think about…the teachers. I had some terrific ones! So glad you still attend your reunions. Lots of fun for sure. Sounds like a terrific time, Katherine. That you all are planning on getting together so soon says it all. Have fun! Oh Ann, hats off to you for being one of those hard worker who make it all happen. Have fun at your reunion! Hope you have a terrific turnout.